Allure Home Improvement & Remodeling, LLC will design and build a deck to suit your lifestyle. Convenient, attractive features and personal touches are added to make your deck unique. From wood replacement to small porches to larger, multilevel decks, Allure Home Improvement & Remodeling, LLC’s competitive pricing transforms backyard dreams into a reality. Enjoy years of relaxation in a well-built outdoor living space by Allure Home Improvement & Remodeling, LLC. 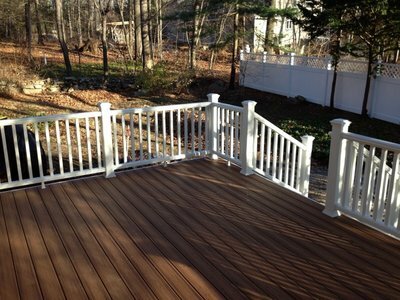 Allure Home Improvement & Remodeling, LLC has been offering deck building expertise for 12 years. Using only top grade materials, Allure Home Improvement & Remodeling, LLC deck builders will draw up unique plans or work to your specifications. Every aspect of the project will be done professionally, with plenty of special touches to meet your needs and fulfill your whims. Allure Home Improvement & Remodeling, LLC will ensure your deck is built in compliance with local building codes. Custom decks don’t have to cost a fortune, and Allure Home Improvement & Remodeling, LLC offers the fair pricing to prove it. Hire the deck repair and deck building pros at Allure Home Improvement & Remodeling, LLC and you can expect top quality materials and beautiful craftsmanship at an affordable price that creates greater pleasure and value for your home improvement investment. Local, knowledgeable and affordable, Allure Home Improvement & Remodeling, LLC will design your custom deck using quality materials. Call Allure Home Improvement & Remodeling, LLC today at (203) 212-8252 to book your free estimate.